Author: Roland C. Stevenson †. Edited by: Thilo C. Schadeberg. Series edited by: Gudrun Miehe, Hilke Meyer-Bahlburg. 10 pp. Roman, 333 pp. 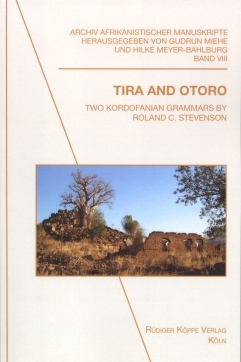 The present volume presents the so far unpublished manuscripts by Roland C. Stevenson on Tira and Otoro, two Kordofanian languages spoken by 40,000 (as of 1982) respectively 10,000 speakers (as of 2001) in the Nuba Mountains of central Sudan. Roland C. Stevenson was born in Romford in Essex, England in 1915. He first went to the Sudan in 1937 to work with the Church Missionary Society. 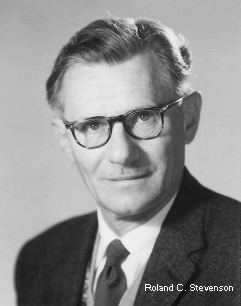 From that time on, almost until his death in 1991, he devoted his life as a missionary and linguist to the study of the languages of the Nuba Mountains. His best-known contribution to African linguistics is his PhD dissertation, presented at the School of Oriental and African Studies (SOAS), University of London, in 1951. It was partly published in the journal Afrika und Übersee, vols. 40–41 (1956, 1957) under the title A survey of the phonetics and grammatical structure of the Nuba Mountain languages, with particular reference to Otoro, Katcha and Nyima. He also supplied the data for sections on the languages of the Nuba Mountains in Part 3 of the Handbook of African Languages by A.N. Tucker and M.A. Bryan, The Non-Bantu Languages of North-Eastern Africa (1956), and ist companion volume Linguistic Analyses (1965). Much of his work, however, has remained unpublished. After his death, his family expressed the wish that his papers should be preserved and made accessible to the scholarly community. Among the Stevenson papers, the present manuscript grammars are of 1942 (Tira) respectively 1943 (Otoro). In many branches of science, including linguistics, a manuscript of that time would be obsolete and of interest only to the history of science. Not so in this case. Except for the extracts that found their way into Stevenson’s thesis and Tucker and Bryan’s Handbook, the data and analyses presented here for the first time in print are genuine and novel additions to our knowledge. Schadeberg has chosen to publish Stevenson’s Tira and Otoro grammars as volume 8 in the Archiv Afrikanistischer Manuskripte. According to its editors Gudrun Miehe and Hilke Meyer-Bahlburg, the series is intended to publish valuable manuscripts documenting African languages. In regard to the many uncommon typological features of Tira and Otoro, the Archiv Afrikanistischer Manuskripte is an appropriate publishing place for Stevenson’s grammars. Today, the Kordofanian family of the Niger-Congo phylum remains one of the most poorly researched language families in Africa and worldwide. This book makes two descriptive grammars available to the scientific community, respectively Tira and Otoro (both of which belong to the Heibanian branch of Kordofanian), and is therefore a most welcome publication. [...] Stevenson’s grammars of TI and OT are of great scientific interest, for, as the editor says, they “are genuine and novel additions to our knowledge” of Kordofanian languages. In conclusion, I would like to congratulate Thilo Schadeberg on having edited and published those precious grammars, thus enabling other people (be they scholars or speakers of the languages described) to have easier access to the linguistic data they contain. [...] despite their age, these manuscripts constitute important additions to Kordofanian linguistics: They add valuable descriptive information on two poorly-described languages. I also expect that these manuscripts contain important historical information: they describe the languages as they were spoken in the 1940s – it is highly likely that the present-day languages have changed, and that any contemporary description of these languages would benefit greatly from the diachronic information contained in these grammars. In editing and publishing these manuscripts, Schadeberg has done a great service to the field, and it can only be hoped that Stevenson’s remaining manuscripts will be made available at some point in the future, too!